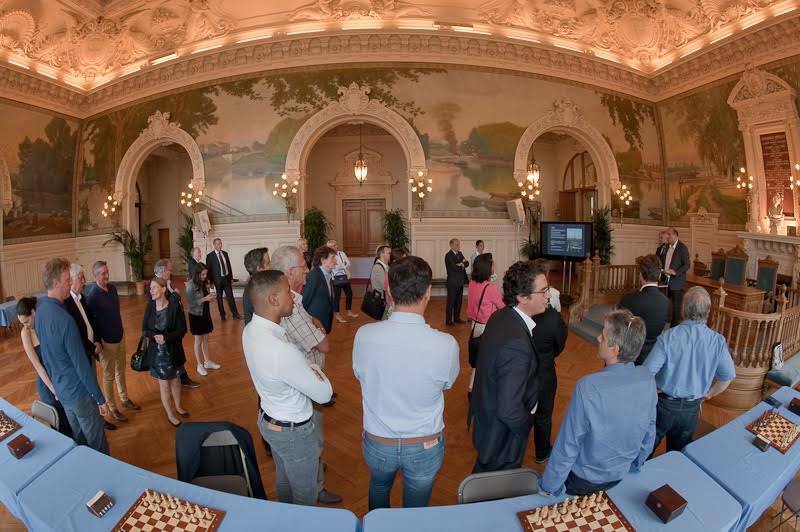 First European Corporate Chess Championship starts tomorrow in the reception hall of the Town Hall of Asnières, in Paris, France. The innovative European event aims to bring closer the Business community with Chess and the European Chess Union. 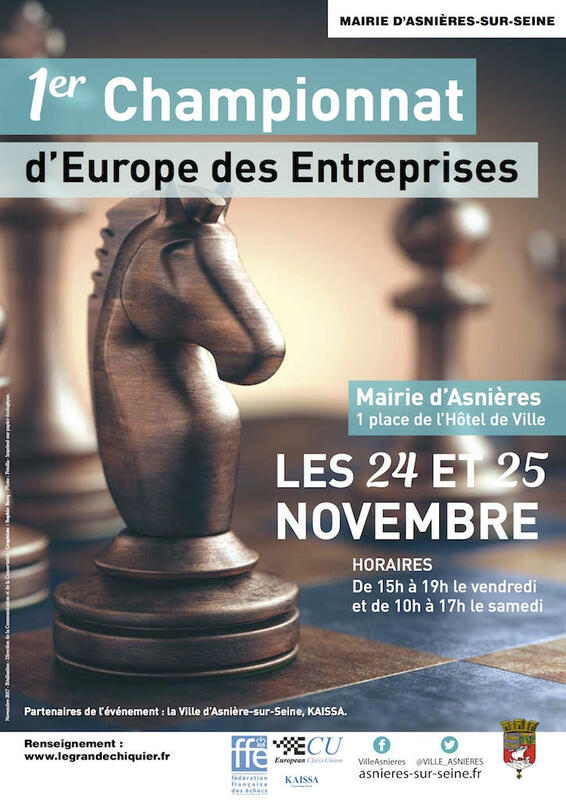 The Championship will be declared opened at the Opening Ceremony with the attendance of the Mayor of Asnieres, Mr. Manuel Aechlimann, the President of the French Chess Federation, Mr. Bachar Kouatly, the President of the European Chess Union, Mr. Zurab Azmaiparashvili and the President of KAISSA (organiser) Mr. Franck Droin. The ceremony will take place tomorrow at the playing venue before the start of the first round. 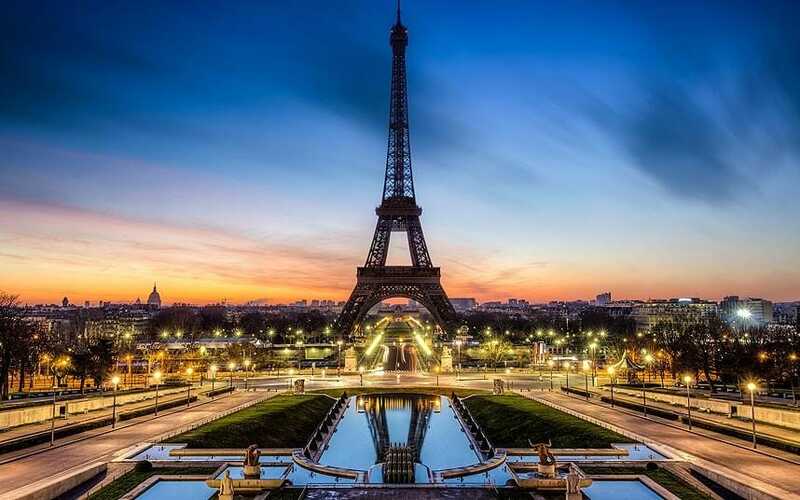 35 teams have registered for the event among whom are well known world brands and institutions: KAISSA (FRA), Leonard (FRA), Gazprom (RUS), Sberbank (RUS), Kids Up (FRA), Engie (FRA), Dassault Systemes (FRA), Banque de France (FRA), Comite Olimpique et Sportif de Paris (FRA), A l’Abri (FRA), Abyss Proprete (FRA), Deutsche Bank (GER), Corsica Flash (FRA), Oracle (FRA), Echesspedia (BEL), Amsterdam University of Applied Sciences (NED), Kaspersky Lab (RUS), Event Consulting (GRE), Colliers International (FRA), AXWAY (FRA), Carte Blanche Partenaires (FRA), Union Sportive de l’Enseignement du Premier degre a Paris (FRA), JTBB Avocats (FRA), Europchess (BEL), Sodern Ariane Group (FRA), Academie de Paris (FRA), OCDE1 (FRA), UrbanHello (FRA), Microsoft Europe, EY (FRA), RZD (RUS). 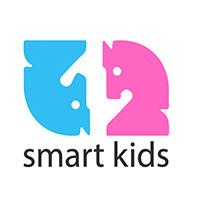 Among the chess players compete in the Championship there are World top players, 13 GMs and 10 IMs, such as: Fedorchuk Sergey (RUS, 2704 Rapid rtg), Rublevsky Sergei (RUS, 2679 Rapid rtg), Fressinet Laurent (FRA, 2621 Rapid rtg), Dervishi Erald (ALB, 2552), Vaisser Anatoly (FRA, 2512), Guliyev Namig (AZE, 2487 Rapid rtg), Skripchenko Almira (FRA, 2423 Rapid rtg) etc. Each team is composed of 4 players + 1 substitute players. The starting rank list of the teams and players is available on the Official website of the Championship. 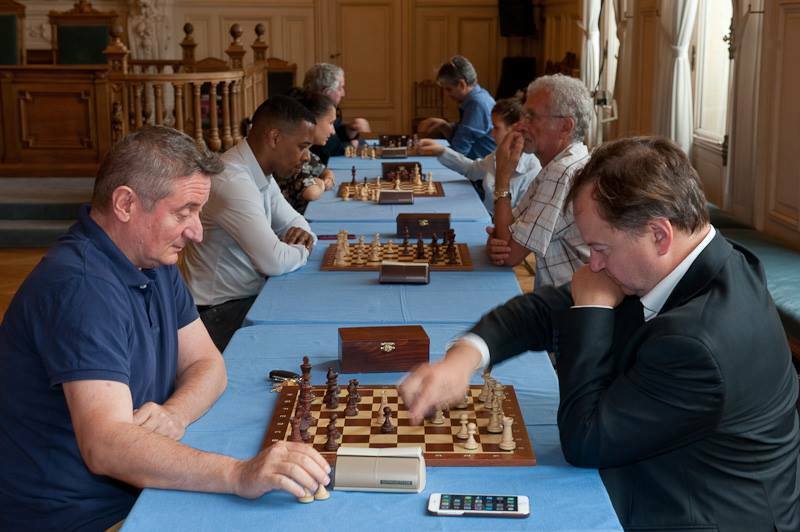 The Championship will be played in 9 rounds, Swiss system, with time control 15 minutes per game + 3 seconds increment per move, starting from move one. The total prize fund of the event is 6.000 EUR, and top three teams will be awarded with regular prizes together with trophies and medals. The Championship is open to the public. Detailed program of the Championship can be downloaded bellow or here.